My 7 golden rules for getting stuff done. There’s a quote from a NASA commander that goes something like “The most important person in the room is the one who knows what to do next.” I guess when you’re dealing with lives and critical, split-second decisions, it’s spot on. In an operational sense, I have to wonder if real estate is any different. 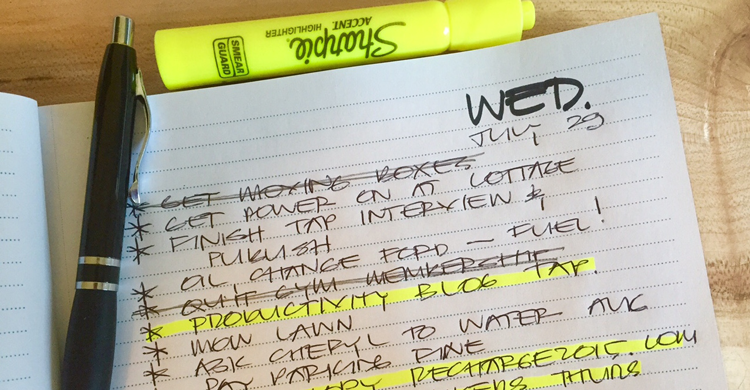 At any time, we’re bombarded with dozens of options and cascading to do lists that have the power to completely overwhelm us. It’s bad enough to be busy all day and exhausted by 6pm without feeling the disappointment of not getting the important things done that seemed so clear, obvious and doable at 8am that morning. Today is Wednesday. On Friday morning, movers will arrive to collect our stuff and relocate us to our new home. I’m yet to pack a box. My office, wardrobe, bathroom, garage tools and basement things are sitting waiting for my attention. So that task is kind of dominating my thinking right now. But first I need to finish this blog, re-do copy for the RECHARGE website, cancel my gym membership, make sure power is connected at our new place, pay a parking ticket, mow the lawn, organize the neighbor to water the garden for the next 3 weeks, change the oil in my car, order new reading glasses and they are just the top-of-mind things that keep jumping out onto the path in front of me. But with age comes a little wisdom and I’ve learned to deal with having a massive to-do-list and getting things done. I’m not panicked. I’m calm and functioning because I have a system that has worked very well for me for many years. Here are my thoughts on structuring a day that will let you maximize your results and leave you feeling like you conquered the mountain. First things first. It’s easy in real estate to feel completely overwhelmed and flooded with things that need to be done. It’s almost impossible to function when this happens because the anxiety of unfinished tasks clouds everything. It’s also hard to focus on getting something done when your brain is constantly reminding you of other things that need doing. My trick is to sit down and write a list. Just have a brain dump of EVERYTHING that’s on your mind. Don’t hurry, take your time and check that you’ve listed everything. When your list is done, choose the three things that MUST be done that day and underline or highlight them… then begin. This tactic never fails to help relax me and make more productive. In the summer, I like to be on my mountain bike by 6 or 6.30am. The first 2000 metres is a motherless, godless and evil uphill trek on a narrow, often muddy path. Then I get level out for about 10 minutes before rewarding myself with 3000 metres of downhill bliss that never fails to thrill and excite me. Kind of a mini effort and reward technique that sets up my day beautifully. In the winter I’ll hike for an hour. Then shower, breakfast, coffee and at my Mac writing by 8am when I seem to do my best work. I tackle the essential must do actions early and get them done. The rest of my day is working with a list of tasks and simply crossing stuff off and adding new ones. I keep a journal as loose sheets of paper get lost and don’t carry the same importance. In real estate I worked solidly each morning to set up new listing appointments. Although I would prospect Tuesday to Friday, my BEST time was Saturday AM because it was easier to catch people and Saturday is known around the world as real estate day so my calls were always better received. Monday was solid call backs to buyers and sellers setting up my week. If I stopped prospecting each morning, my numbers fell almost immediately. Nice segue to my next point. Want to know what EVERY million dollar agent does 5 days a week? They reach out and connect with potential clients by phone every day. This single activity will make you wealthy beyond your wildest dreams but most agents don’t do it. They fluff around doing other less important tasks and miss the big bucks to be made by completing 2 hours of solid prospecting each day. Top agents have their favorite time to complete this essential daily prospecting and most prefer a 2 hour block between 8am and 11.30. So when you commit to doing this, give these 2 hours your priority. The blue dollar actions are the vital tasks that make you money. They are prospecting, doing an open, doing a listing presentation, negotiating with a buyer, meeting with a seller to discuss their marketing and working with A grade buyers. Everything else is secondary and the more blue you have in your day, the more success you will enjoy. A few of years back, our good friend Amanda had just finished a re-certification course for her role as a volunteer with the Canadian Ski Patrol. Her small sedan was waiting to turn at an intersection when she was hit from behind by a car traveling at more than 100kph. Her small vehicle crumpled around her and started a 7-car chain reaction. When the paramedic team found her with VSA (Vital Signs Absent) the police closed down the highway, which is standard with all fatal motor vehicle accidents. The 36-year-old woman who hit her was texting. While it was obviously very stressful for her family and friends at the time, it also made me think about the dangers of distraction. Obviously this is an extreme example but I believe so many agents fail to realize their full potential because of the distractions that surround them every minute of the day and rob them of opportunities. So when you’re doing critically important blue dollar actions, switch off the social media and email distractions and anything else that takes your eyes off the task and give yourself 100% to what you’re doing. If you’re waiting for returned calls from prospecting, set you phone to silent but leave it where you can see it. Two cars behind Amanda was her husband Anton (himself a Paramedic) and another Ski Patrol volunteer who (amazingly) carried an oxygen tank and mask. They continued to work on Amanda with the Paramedic team. Within a couple of minutes they got a weak pulse. Her injuries were horrendous and she only regained consciousness two days later in hospital. Her doctor waited 2 more days before giving her the news that she would never walk again and never have children… but clearly, he didn’t know Amanda. 18 months later she was skiing and hiking. 3 years later she gave birth to a beautiful daughter with knowing eyes who can melt your heart. And be sure to check out the Show Notes where Garth shares the Daily Tasks list that made him one of the top agents in the world. When we decided to get a career in real estate, we also made the decision that we wouldn’t be swapping our time for money and working for an hourly wage. That’s what office workers and teachers and fireman do. Don’t get me wrong, these are vital positions that we can’t live without but they are VERY different to real estate. We are lone soldiers in the economy who leverage our skills, training and ideas to earn the income we want. We work hard, often long hours. Sometimes the wheels fall off when the deal that’s just consumed us for the last 2 weeks goes south. Stuff happens. We deal with it. We overcome. We focus and get back on the horse. Most of the top agents I know treat their ‘play time’ the same way. They treat their leisure and non real estate activities as seriously as their career. They set goals and treat themselves regularly. The plan and schedule exciting breaks and vacations that are almost as much fun to look forward to as they are to experience. Full busy lives are the best lives. 6. Wherever you are, be there! Last Sunday, Christine and I and some friends took the boat out to an Island in Georgian Bay (Ontario). It was a magic day. We found a spot and anchored offshore then hauled our cooler of drinks and lunch onto the beach. Canadian summers are short so we make the most of each minute. This day was stunning. I decided to take our dog Roxi for a walk along the beach and being the nosey parker that I am, I couldn’t help noticing how many people were on their cell phones. One family stood out. There were 4 young children playing in the water with a ball. Their mother was on the beach making lunch while their dad sat hunched over his phone. One child, a son, was tugging at his shirt begging him to play. Now I have no idea what was going on. Maybe this guy was saving us from World War 3 but his boy couldn’t have cared less. In that moment I felt the pangs of guilt and regret when, as a young dad, I could be found doing the same thing. Here’s the advice I gave myself back then: We only get one go around, wherever you are be there. Real estate’s Top Agents do the tough, hard and unpleasant things first because they know that’s where the diamonds are hiding. Take a second now to think of that thing you’ve been putting off a do it as soon as you finish this article. Call that seller and make a time to meet and help them understand their price is too high. Trust me. Doing the tough things will make you wealthy because most agents are too weak to do them. They put stuff off and ‘hope’ it will all work out. That’s why only 5% of agents are making 95% of the income in our industry. Which camp do you want to be in?